Praia do Forte, one of Brazil's most attractive beaches, is a fun destination which can easily be added to a trip to Salvador. A district of Mata de São João (pop. 37,201), Praia do Forte is about 60 kilometers to the north of Salvador, on the Coconut Tree Coast. Get up early and watch the sunrise - one of the most beautiful in Brazil. Visit the local base of Projeto Tamar, a non-governmental organization which protects sea turtles. The base is open year long. From July to September, biologists are managing the nests; in the summer, the newly hatched turtles do their race to the sea. At Projeto Tamar, visit the Garcia D'Ávila Lighthouse, built in 1971. Watch humpback whales (Megaptera novaeangliae; in Portuguese, they're called baleias jubarte) from July to October. Instituto Baleia Jubarte offers boat rides and also hosts a voluntourism program (July-November). The fort which gave the beach its name is no longer standing. But you can take a tour of the 16th-century Garcia D'Ávila Castle, located on a hilltop and just two kilometers from the village. Built in 1551, the castle, also known as Casa da Torre, is the only construction with medieval characteristics in the Americas. Show off your game on the P. B. Dye-designed green of Iberostar Praia do Forte Golf Club. Walk, ride a bike, a horse or a quadricycle at Reserva de Sapiranga, an Atlantic rainforest preservation area with seven signaled trails. You can also take a dip in the Pojuca River. Go on an adventure with Portomar - they offer parasailing, buggy tours, and canoe rides on the Timeantube Lagoon alongside many more adventurous outings..
Go snorkeling (rent masks at Projeto Tamar). 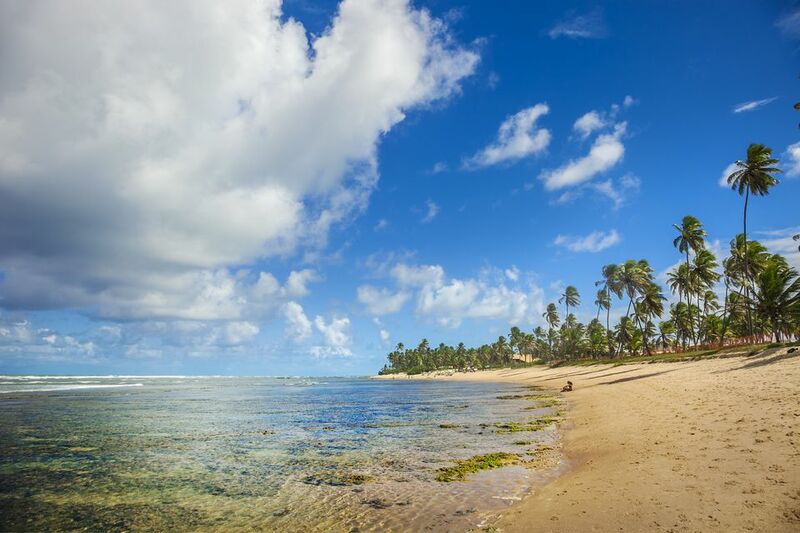 Praia do Forte, in Bahia, is famous for its all-inclusive resorts. But the beach has retained its village atmosphere and a laid-back lifestyle which is well reflected in local pousadas and a hostel. Here are the best accommodations in Praia do Forte, for a wide range of budgets. Integration with nature and sustainable practices; suites with expansive views of coconut groves, gardens, and the sea are some of the best features at one of Brazil's best beach resorts. Opened in 2008, the resort with 536 guest rooms, five restaurants, and five bars is great for couples and families with kids. More five-star comfort, Iberostar style, on one of Brazil's most beautiful beaches. The hotel has 630 guest suites, four restaurants, five snack bars and restaurants. Opened in 2009, the pousada is a short walk from the village center and the beach has 31 guest rooms, some with Balinese touches and others with salvaged wood furniture made in Tiradentes, Minas Gerais. A bar, a restaurant, a pool, and a kids' area are some amenities. A pousada with 30 cozy guest rooms in rustic style and a restaurant serving Bahian culinary delights. Near the village center, the hotel has 50 guest rooms, a restaurant, a bar, and an area for the preparation of meals for babies. The hotel near the ocean, with 32 guest rooms, opened in 2004. Codfish is its seafood restaurant's main specialty; there are two pools (one for kids) and a playground. Opened in 2001, the Pousada follows sustainable practices such as the responsible disposal of trash, solar energy, and the use of biodegradable products. It has 32 guest rooms. In the village center, the Pousada opened in 1990 has kept up its bright looks. It has 27 apartments, a restaurant, and a pool. With 11 apartments and four bungalows, the toes-in-the-sand pousada has colorful ambiance and nice places to rest while looking at the sea. A bistro serving fine dishes à la carte, such as the fillet au poivre vert, as well as an almoço executivo, or fixed price lunch. The restaurant has a resident DJ. Varied Bahia food and a feijoada buffet on Saturdays, Sundays and holidays are the highlights. Contemporary Bahia and Northeastern food. All vegetables served are organic. A local favorite serving sandwiches, pies, snacks and ice cream. One of the best-loved Italian restaurants in Bahia. Chef Nalva Guidetti prepares dishes from the Tuscan and Bolognese culinary. It's easy to get to Praia do Forte by bus from Salvador. Linha Verde (phone: 55-71-3460-3636) has a few daily buses from the Salvador Bus Terminal. The trip lasts about one hour and 40 minutes. There are also buses that depart several times a day from a stop near the ferry boat to Itaparica. Praia do Forte Hostel has the schedule for those on their website. You can also take a taxi or find out whether the place where you're staying offers transfers. Expect to pay about $60 or more.